Do the numbers 26.2 mean anything to YOU? 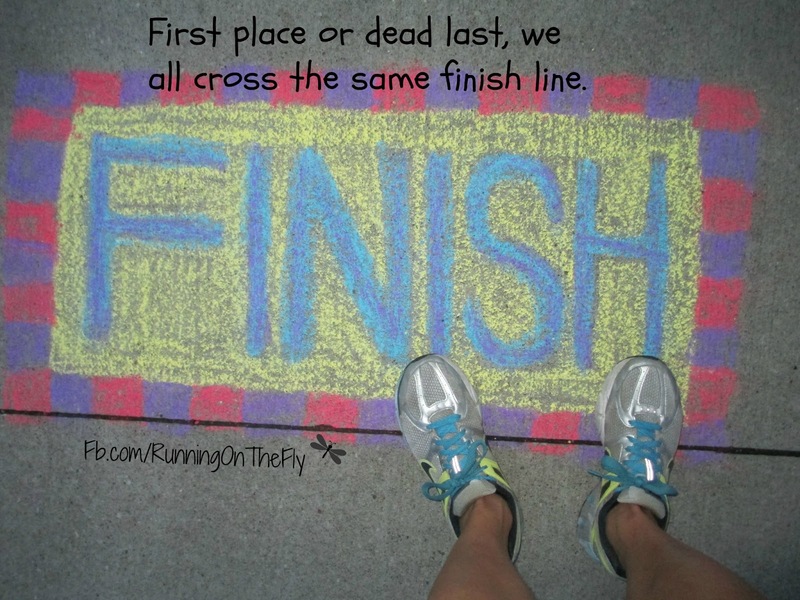 I heard somewhere that a marathon doesn't just change you at the finish line, but also at the start line. Hmmmmm. 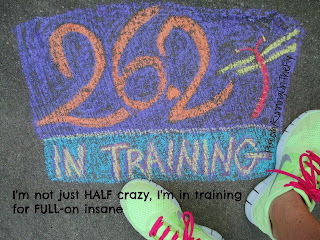 I would argue that it changed me the moment those numbers, 26.2, started dancing in my mind. Granted, the first several times those numbers appeared in my thoughts, I quickly ran from them (no pun intended). I have been running half marathons for 5 years now, and have been QUITE content doing them. Then, I decided to start a page on Facebook, Running On The Fly. Quickly, I laughed those numbers out of my head (again). I'm a 13.1-mile runner after all, I should just be content with that. Right? Well, the more runners I became acquainted with, the bigger those numbers grew (and more frequently they kept reappearing) in my head. Finally, I realized that there will never be a "perfect" time to do a marathon. Why wait until I run a sub-1:45 half? 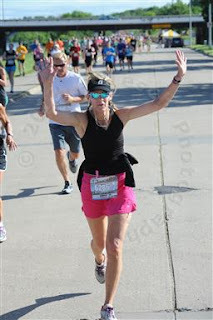 The thrill of crossing the finish line won't be any more euphoric if I wait until the last kid goes off to college than it would be if I conquered the 26.2 miles in a few months......why not just do it this year? Why not just do it in September? Truthfully, as much as I love the 13.1 distance, it really isn't much of a challenge for me anymore. I continue to work on my speed and pacing to finish each race faster...but, that is something I can continue to do for the rest of my life. The thought of doubling that distance, well... quite honestly, is a little scary. Actually, it's VERY scary. But, there was a time when running 3.1 miles was a challenge...and I can now run that (plus an extra 10 miles) non-stop. 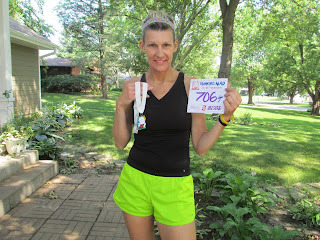 So, I made the commitment and officially registered for the Quad Cities Marathon, scheduled for September 22nd. This week is the point in my training schedule where I will run the farthest distance of my life, going past the 13.1 miles that I have grown so comfortable (and secure) with. I know I won't run it fast, but I know I will be able to complete it. What have I learned so far? Doing the long runs each weekend makes me feel like I'm constantly racing, but without the expense of registration fees. I have to charge my Ipod weekly, continually be drinking water to stay hydrated and my favorite pair of wool running socks are spending more time in the laundry room than on my feet. One of the perks, though, is that my recovery time gets faster every week. The first time I ran a half marathon (5 years ago), I had a difficult time walking (without resembling Frankenstein) for several days...now, I can simply jump in the shower, do a few stretches and start the whole hydration process all over again for the following week's long run. Progress, I'll take it! I really think I could grow to love trail runs. Maybe not as much as half marathons, but I definitely can see more of them in my future. Just not any time in the next few days or weeks. The Grimes Farm Trail Run took place on Saturday, July 13th, and I was an eager participant. The Grimes Family Farm is located just west of Marshalltown, in central Iowa. 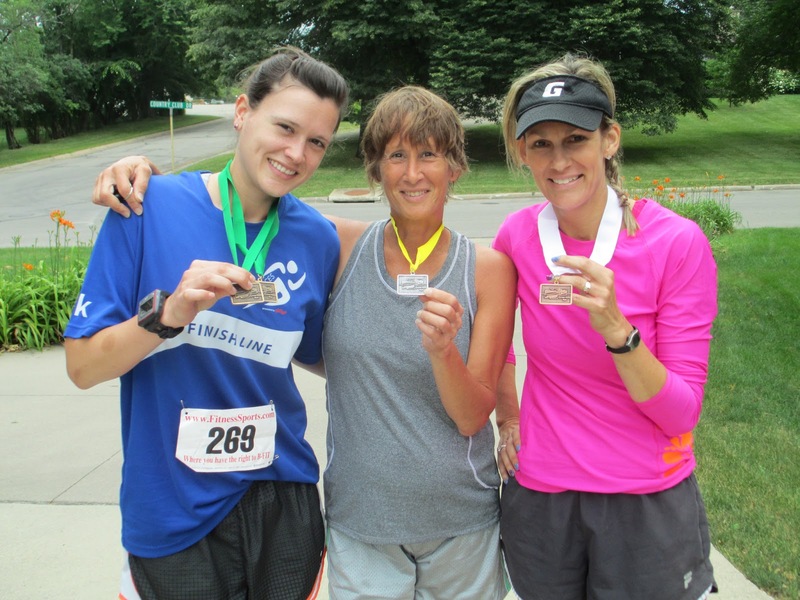 Every year, the Grimes family hosts a series of race events: 5K, 8K, 1.6 mile, and kids' races. All races take place on the trails on the land owned by the conservatory. 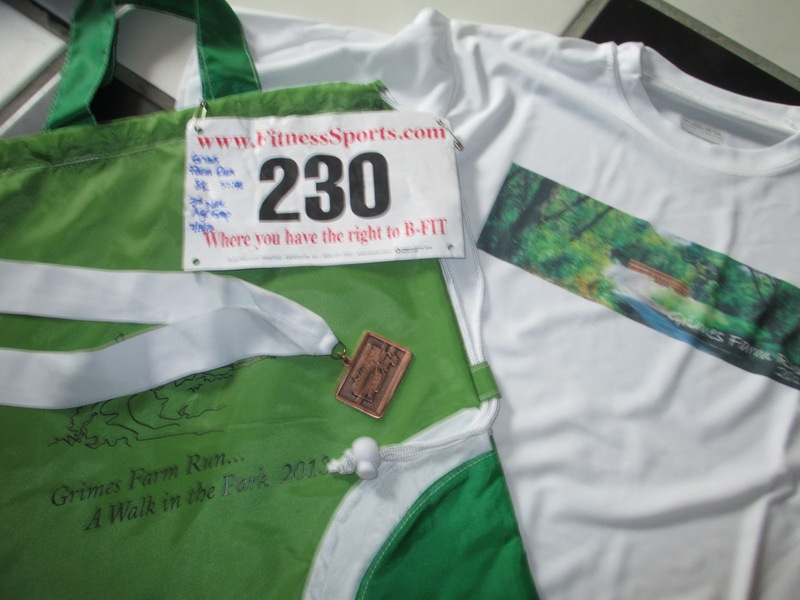 Along with the race bib, participants received a tech shirt, draw-string sport bag and a pin oak seedling (as well as numerous refreshments following the races). I brought along the camera, but forgot it in the car. And that is a big regret. The trails were beautiful and very well-maintained. 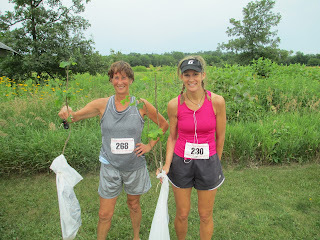 I ran the 8K trail run with my friend, Linda. Her daughter, Dani, also came along. Dani was a very well-decorated high school runner in track and cross country (State of Iowa champion, none-the-less). It's great fun to watch her go, but I am thankful she's in a much younger age group so I don't have to "compete" with her. The 5K and 8K share the majority of the same trail, except for a one mile out and back leg (for the two additional miles on the 8K course). As I mentioned, the trails were beautiful. There was one major hill, shortly after the start, that was very long and challenging. About 2/3 of the way up the hill, there is a lookout tower, with a volunteer waiting at the top to mark the hands of runners who take on this "bonus" climb (they get a special reward for doing so). 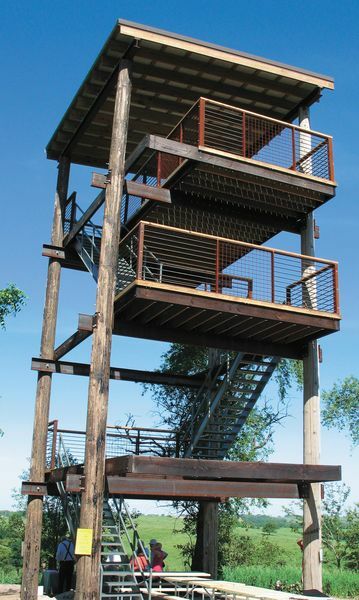 The tower has three sets of stairs that lead to the top, similar to climbing three stories of a building. I love stair-climbing, so I decided to take on this extra quest as well. 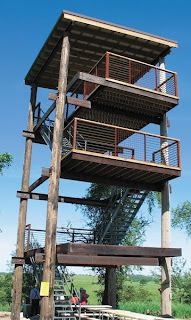 I made my way to the top of the tower and back down in a couple of minutes. I realized this would alter my actual finish time, but the challenge was there and I knew I would regret not doing it. All or nothing! After descending the tower and finishing the remainder of the big hill, the rest of the trail was pretty flat and not too threatening. I did notice some initial stiffness from my old friend, the piriformis. Whenever I do races with hills (especially if the hills are right at the start of a race), I almost always have some issues with piriformis stiffness. I stretch before the event, but none-the-less, this is just an ongoing thing for me. It is getting better, but it still exists (probably to keep me humble). I did slow down and walk a few times, to give my legs a break. There were some water stations, so it all worked out. I can barely walk and chew gum.....trying to run and drink is like taking a shower in public for me, so I usually have to walk through the water stations anyways. I felt like I was running the first half a little slow, but with the big hill and stair climb I knew my pace would be a little off. Not to worry. I usually can pull off a negative split in most events, so I don't let myself get in a panic. Eventually, I reached the turnoff for the 8K runners. This part of the course was well maintained, but we were warned it would be a little rougher that the other trail.....and they were correct! There also were a lot of twists and turns, which made for a very scenic journey. I was probably halfway to the turnaround when I started to see the lead runners coming back. 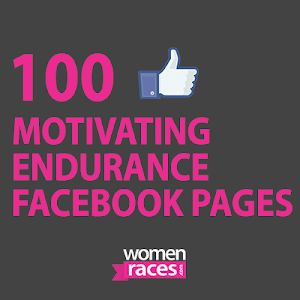 I love cheering on fellow runners, so I always clap or tell them "Good job!" or "Looking great!" 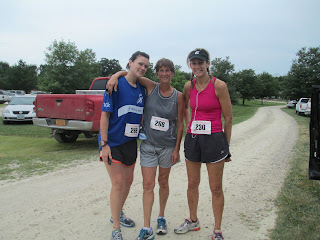 I had just cheered for a returning runner, and the very next moment I was flat on the ground. And I went down hard. Even with the grass on the trail, the ground was very dry and compact...and unforgiving. I didn't just fall and scrape my left knee, I also did a (very ungraceful) roll. As soon as I pulled myself back up (Mr.Returning Runner chose to leave me in his dust), I could tell something wasn't right. I could feel some pain near my rib cage. I had heard that if you break a bone, you will KNOW you've broken a bone. I didn't feel anything too outrageous, so I pressed onward. But my rib cage hurt. It continued to hurt for the remaining 2 miles or so that I had left. It didn't hurt to breathe, so I was certain my lungs weren't injured. But every time I twisted or leaned into a curve, I could feel something in my rib cage area. Despite this discomfort, I was actually doing great with my pace. I made my way to the turnaround, and back out to the main trail for the final 3/4 mile of the race. I had gone through so many turns and curves, I had lost my bearings. So, I was pleasantly surprised to see the finish line so soon. I was able to up my pace, and finished the 8K in 51:40. Running trails is very different than running on pavement. 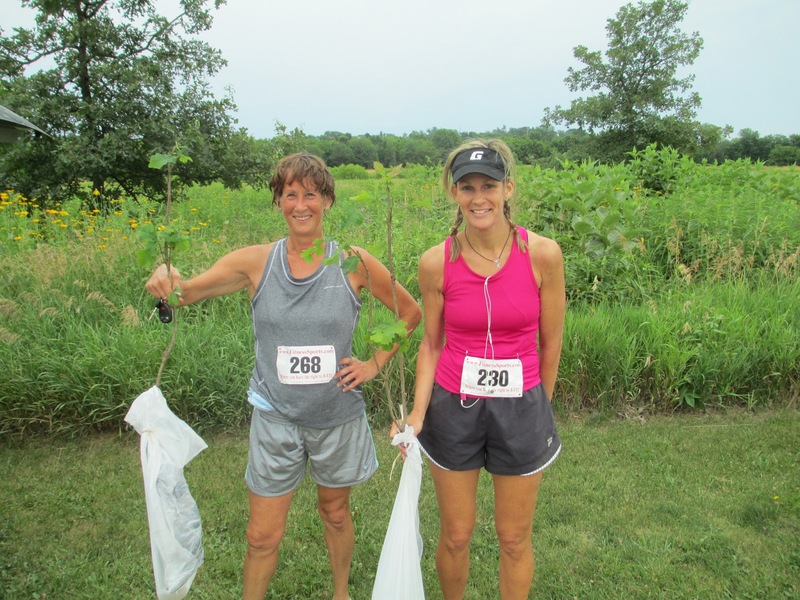 The grass and uneven terrain require a slightly slower pace as you navigate the course. There are numerous times when you think you have solid footing, only to hit a patch of gravel or dirt and then need to shift your balance to remain vertical. I am kind of a klutz by nature, so I probably look like a comedy act as I attempt to keep my composure when my feet are slipping and sliding in opposite directions. I read somewhere that your trail pace may be 1-2 minutes slower (per minute), depending on the variables (slope of terrain, thickness of grass, obstacles, etc. ), so my finish time is decent for me. Given the fact that I "detoured "on the tower climb, walked a few times and then tumbled .....I am happy and satisfied with my effort. They were very generous with their awards. All the kids received medals for completing their races. They had awards for not only runners (in the various age divisions), but for the walkers as well. Dani was the fastest overall female in the 5K, so she received a cash prize and medal, and also a first place medal for her age division. 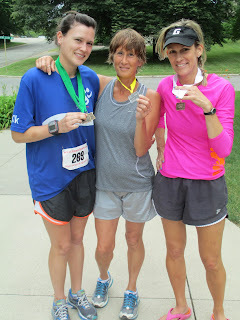 Linda and myself both placed in our age division (in the 8K), receiving 2nd and 3rd medals respectively. For those who did the bonus tower climb, they had a big selection of t-shirts from past years and first-aid kits to choose from. 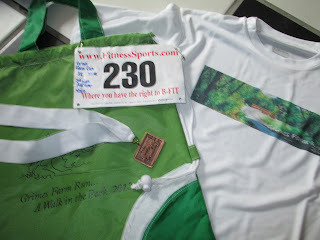 I already have too many shirts from races, so I opted for a first-aid kit. I thought that was a nice touch! I thought this race was a great event. We were blessed with optimal weather (70-degree temps, low humidity and plenty of cloud cover). Numerous volunteers were there to make sure all the details were covered. Plenty of awards for the participants. The trails were beautiful...another reminder that I need to vary my running and not always be on the pavement for my training. My rib cage is sore, but manageable. I suspect I may have bruised or cracked a rib (or two) on my fall. I did a quick search on the computer upon returning home, and discovered there isn't much that can be done for injured ribs other than rest. My breathing is fine, just some overall discomfort if I bend over or twist or turn too quickly. I didn't feel my discomfort required a trip to the ER, so I will wait it out a few days and stay out of my running shoes in the mean time. Will that keep me from ever trail running again? Absolutely not! Ever done a virtual race? I've done a few....some 5K's, a couple 10K's, and now I have officially completed two virtual half marathons. 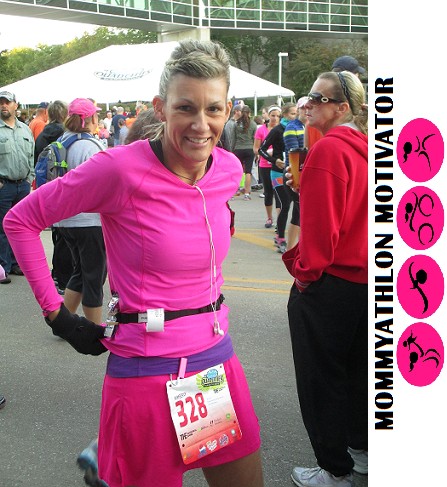 A year ago, I did the Moms RUN This Town summer virtual event, the Hot Momma. It was a half marathon distance, but we were given the entire month of July to complete it. We also had the option to run it in increments, or all in one shot. Having done several halfs, I elected to do the "all in one shot." I was very proud of myself, getting up early on a hot summer morning, and venturing out for 13.1 miles...all on my own. 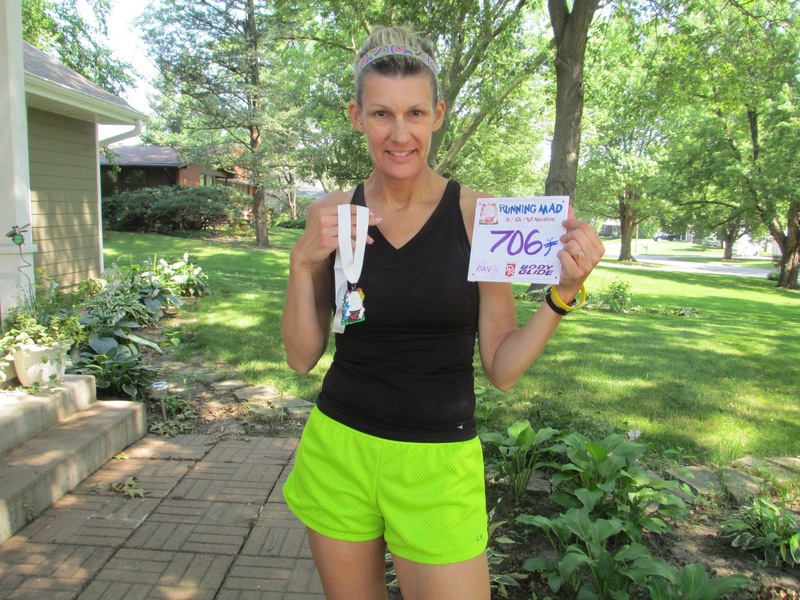 Fast-forward to Saturday morning (July 6th), and I did another virtual half marathon, also sponsored by Moms RUN This Town. This year the theme was Running Mad, based off of the Disney classic story of Alice in Wonderland. 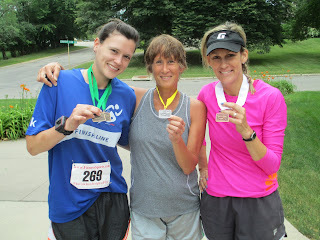 And, this year we had the option of running a 5K, 10K or a half marathon. 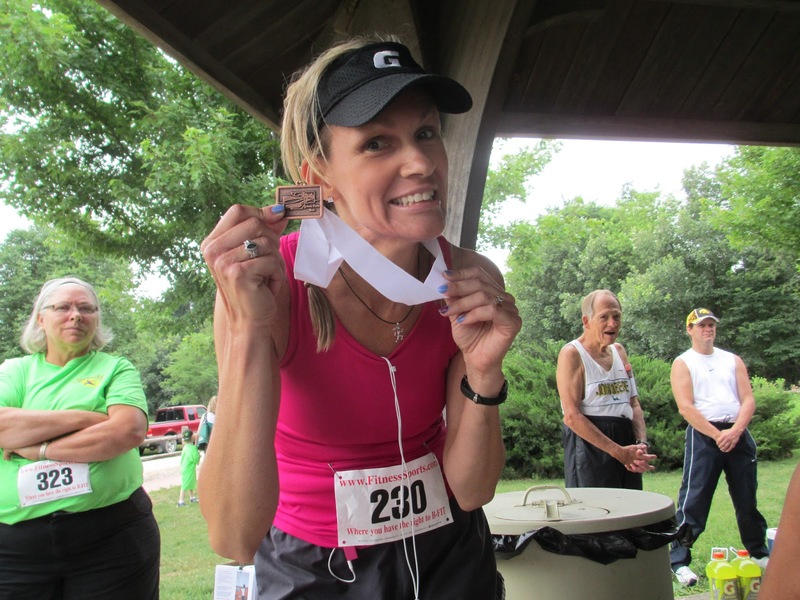 Of course, I elected to do the half.....I know I can run the distance, why not do it for some hardware (the registration fee includes a finisher's medal)? 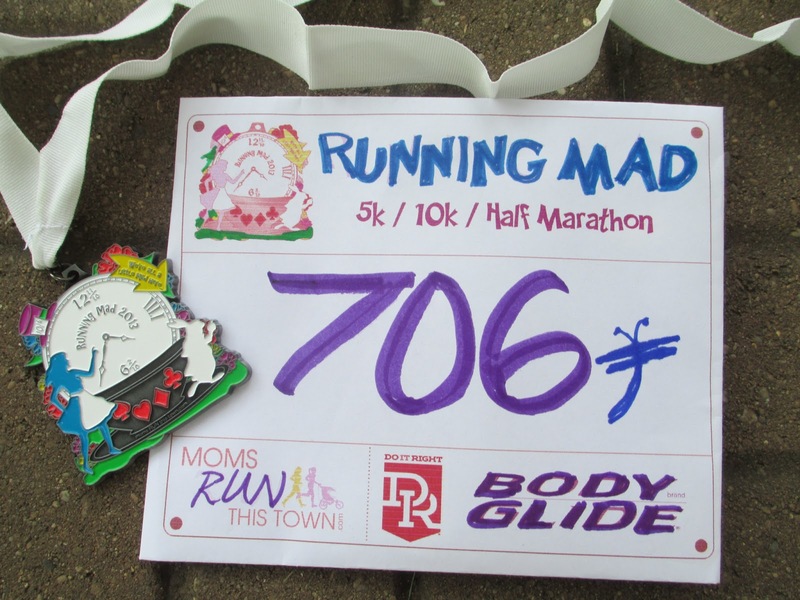 Besides, since I know I can do a half marathon, I would feel guilty getting a medal for running anything shorter if I had the half marathon as an option. I'm currently in training for my first-ever full marathon, so this distance fit nicely in my training schedule. My most recent long run was 10 miles, a week prior. Technically, I was scheduled for 11-12 miles this weekend, but I have more than two months until my marathon, so I have some flexibility. Running the 13.1 miles was a jump in distance, but that is what happens when I train for a half anyways (I train up to 10 miles, recover and run the race a week later). I will just scale back next weekend, allow some recovery time, and resume the mile increases after that. Nothing to worry about. I headed out around 6:30 in the morning to tackle the run. What makes a virtual race neat is that it's a race you run on your own schedule. You don't have to travel to a special location, or run it on any specific date. You do have to complete it, though, on your own. That can be difficult if you rely on the crowd support and energy amongst the fellow runners to get you excited for the run. Most virtuals (if you've paid a registration fee) will have you report your finish time, making you eligible for prizes. I was eager to do this run. I had been looking forward to it all week. I was hoping to maybe set a new PR, but I also knew I just needed to focus on the run itself and not be all consumed with my finish time and/or speed. After all, the LSD's (long slow distance runs) are about endurance, not speed. It was a struggle for the first 5 miles or so. I didn't have any pain, but did have some stiffness in my piriformis area. UGH! It has improved, but is still bothersome at times. I had some great tunes pop up on the Ipod, though, so I was able to keep a smile on my face and press on through the minimal discomfort. 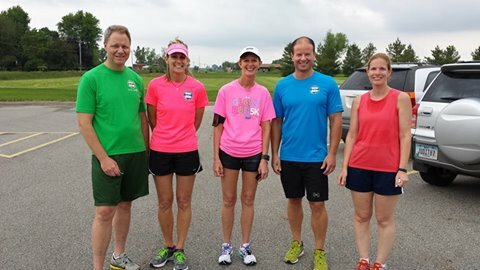 Our town hosts a half marathon race, and the course goes right by my house. It's a double loop course, so I ran one loop and stopped back at my house for a brief water gulp and energy gel fix. As soon as I headed back out to tackle the remaining loop, I felt instantly better. I could already tell my pace was a little faster. I did the first loop in 1:06, not an ideal split for me (almost 10 minutes slower than normal), so I could tell something had not been right. I felt like I was almost running in slow motion for the first loop, I was thankful this second loop was going better. I felt really good until around mile 10. It was then that I started feeling a little light headed, nothing major or scary, but it was there and I was aware of it. I also was feeling thirsty and a little fatigued. I knew the final couple miles were going to be a good test of my determination, but they had to be finished so I pressed on. I ran the first loop of the course "clock-wise," and ran the second loop in reverse to make it more interesting. I also varied some of the streets, trying to be careful to keep the distance accurate in doing so (I do not like doing the same thing all the time...I crave variety!). In switching up some of the streets, I think my light-headed state may have misjudged the distance...it's quite possible I may have ran a little extra distance by accident. No big deal. 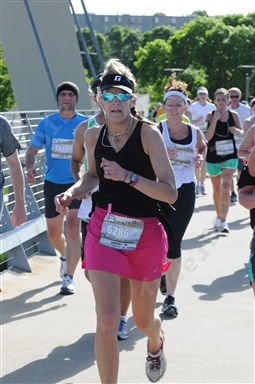 I'd rather run too far and know I did go at least 13.1 miles, than run it too short. So, the last couple miles kept me challenged. Nothing painful, but a little frustrating. I did slow down and walk a few times, but was able to finish strong. When I reached the 13.1 distance, and stopped my watch and walked a few blocks to cool down...I walked very slowly. By this time, it was after 8:30 and the sun had climbed high enough in the sky to make the temps a little uncomfortable. I was able to run the second loop 2 minutes faster, even with the walk breaks, for a finish time of 2::10:19 (just under a 10-minute pace). 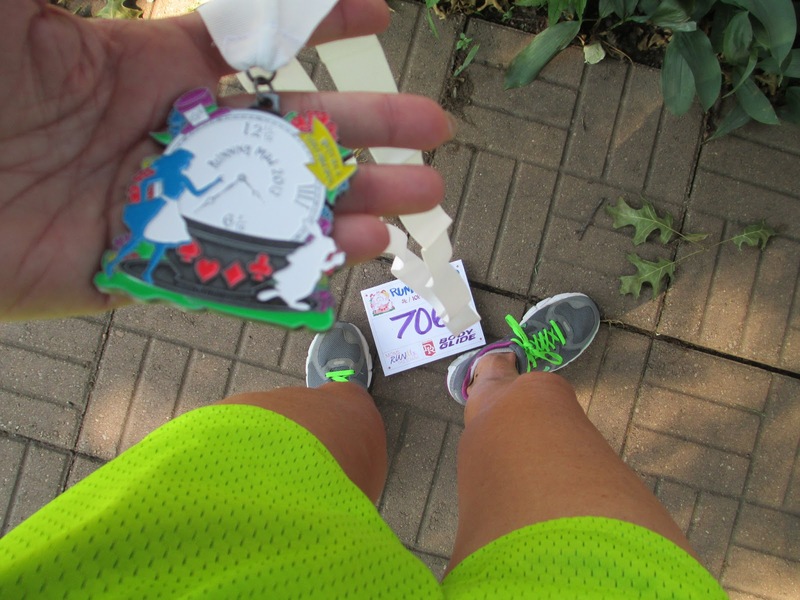 Even though I am capable of finishing a half marathon a good 10-15 minutes faster, that is still a decent time. All is good, I am satisfied. I refuse to dwell on the "what-if's" and feel bad about it. I ran 13.1 miles, and I am thankful for having the ability to do so. Not every run has to be a "race." So, what did this teach me? Well, it reaffirmed my love for the 13.1 distance. I think I may have had a carb-crash, probably from not eating enough prior to running (I had some oatmeal, but maybe should have had something else with it). I didn't take any water with me, so I was probably a little dehydrated. Normally, I have a chai latte' each morning...and I didn't have any before running, so there was a caffeine deficit situation going on, too. 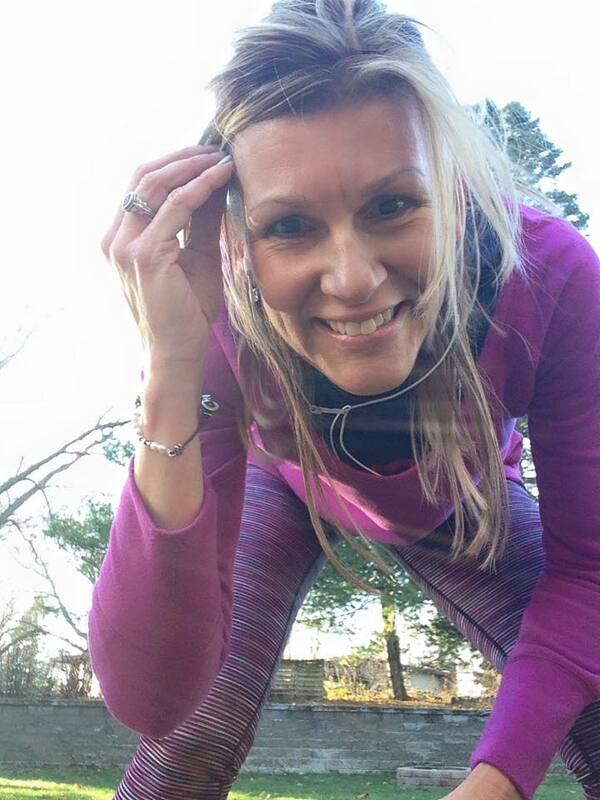 I have a little runner girl necklace I wear for all my events and long training runs, and somehow forgot to wear it, maybe that's also a factor (LOL). All of these are things that I can fix. This was a training run, after all, and that's why runners do them...to figure out what works and what needs tweaking. Also, there were no blisters this time! I typically don't get blisters on training runs, but often notice them when I do the long races themselves. 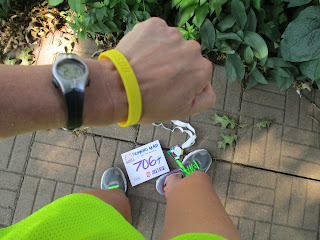 This virtual half served as kind of a milestone (no pun intended) for my marathon training. Most of my long runs from here on will be longer than the half marathon distance, so there may be some blisters (and lost toe nails) in my future....but those are part of the package. I will be running 26.2 miles in a couple months...if that didn't come with a few challenges (or blood, sweat or tears), it wouldn't be a significant accomplishment.